The Danish composer Martin Lohse (b. 1971) writes contemporary music drawing on musical history. The sensitive elegance of Baroque and Romanticism meet the rigorous certainty of Minimalism – a simplicity of expression approaching the insisting and touching which is evident in all three works on this album. They are thus written with the featured artists in mind, fronted by the pianist David Lau Magnussen with the Danish Chamber Players (Ensemble Storstrøm) and an exclusive team of instrumentalists. 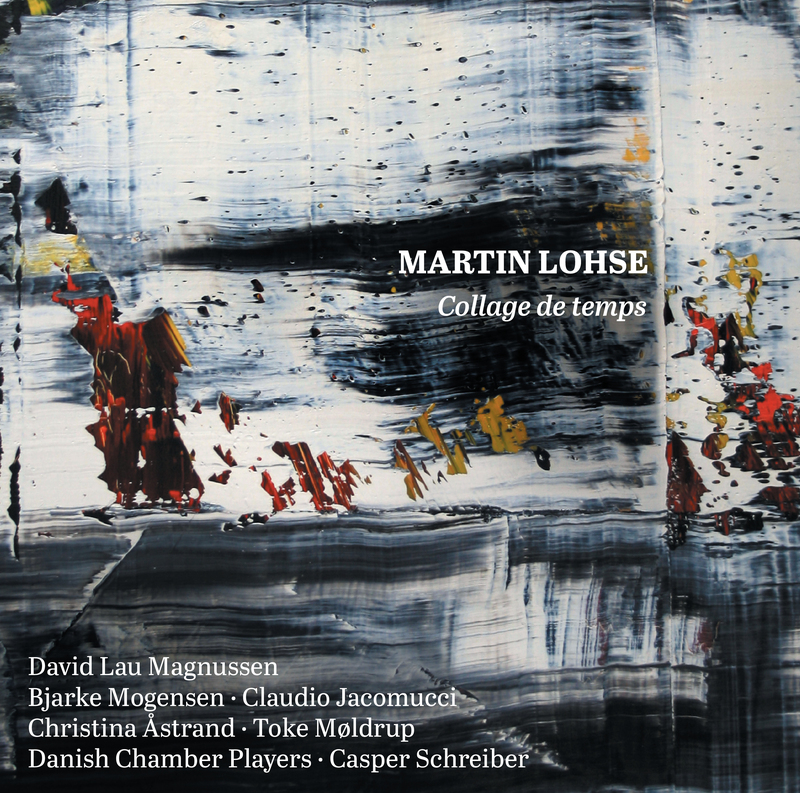 The first couple of minutes of the piano concerto Collage de temps already give a crystal-clear, audible example of Martin Lohse’s composition technique, which he calls ‘mobile’. Fifteen seconds into the movement a rhythmically striking figure begins which appears in a variety of instrumental colours: in the piano, later with an emphasis on strings, then on the winds and with the sound of the full ensemble. A good minute later the character changes completely, and does so again shortly afterwards, and then again. The music hangs in front of the listener as independent figures – mobiles – and although they constantly show new sides of themselves you recog­nize them ­easily. Without invoking the parallel too strictly – it will not bear that – the listening experience when you concentrate on Lohse’s acoustic mobiles is almost like hearing an old Baroque rondo. First one theme comes, then another, then the first one comes back, a third shows its face, the first one returns etc. This parallel make sense not so much in the precise structuring of the score as in the experience of the listener: on the face of it we hear ‘the same’, but we have been changed by the time that has passed, so the music is not identical either to what we heard before. There are several layers in Lohse’s music. The mechanical drive from the first theme in ­Collage de temps is saturated with the driving force and rhythmic certainty of American minimalism, and later motifs can cast the listener’s associations in the direction of Schubert’s Moments musicaux and Verdi’s operas. There is thus a tonal recognizability in the sculptural sound-universe. In purely thematic terms we are not far from the tonal language of the past. But the way the music is put together is radi­cally different. The point of the title, Collage de temps – collage of times or tempi, or composite times or tempi – is almost self-evident when one listens to the music, and is a precise description of what one hears: times that have been put together. Both musical ‘times’ – tempi that are put together with other tempi – and a mixture of times and idioms from musical history, from the dance suites of the Baroque through the elegance of the Rococo and the emotional outbursts of Roman­ticism to the rhythmic swing and motif repetitions of Minimalism. The role of the piano soloist changes depending on the musical motif: sometimes as an integral part of the ensemble, sometimes more like a rampant bull in a china shop; sometimes again as a fully fledged soloist with emphatic, striking musical expression. Martin Lohse (b. 1971) studied with among others Niels Rosing-Schow and Hans Abrahamsen, and his works have been played at concerts and festivals all over the world. He has also been awarded a number of honours and prizes. Lohse is not only a composer; he is also a visual artist and poet. These forms of artistic expres­sion as such need not have anything to do with one another, although the man behind them is the same; but Lohse engages in what appears to be a consistent, fruit­ful dialogue between expressiveness and a structural, theoretical approach to this urge to express himself. As listener (and viewer and reader) you are in no doubt that the works are rigorously structured; and perhaps precisely because the works mani­fest this rigour, Lohse arrives at a simplicity of expression that can approach the delicate and touching. The five Momenti mobile (2013) for accordion duo and piano trio do not exhibit quite the same composite nature as one finds in Collage de temps. Parts of the work are based on earlier works, and perhaps this helps to ensure that every single movement stands out in its own right with its characteristic expression. Like Collage de temps, Momenti mobile is on the whole without dissonances. The composer himself explains: “The main element in the work is a musical tech­nique I have called ‘mobile’, in which various layers of music, each with its own tempo, metre and musical style, are combined in a simple pattern of major thirds that slowly modulate through all keys in an endless sequence, ­creating music with very few or no dissonances.” The light, staccato-like motifs of the first movement have a drive that contrasts for example with the more wistful basic tone of the second movement. But even when the music is most subdued and inward-looking, a calm energy flows through it that gives this quiet music propulsion and direction. The five movements end with a whirling dance after the work has alternated between the contrasts of melancholy and lively energy. Once more the title of Lohse’s work makes perfect sense when you hear the music. The beautiful Italian title Moto immoto – ‘motionless motion’ – describes the contrast between the mobile sections which the composer calls ‘dense’ and the yearning, static sections. As Lohse writes in his programme note, it is quite defi­nitely the slow, sad expression that predominates. The dynamic outbursts in tempo only serve to underscore the general character of torment. In this way the one-movement Moto immoto (on this recording in the version from 2015 for sinfonietta) emerges as a more unambivalent work than either Collage de temps or Momenti mobile; a work in which the longing for coherence that the composer evokes in his programme note to the piano concerto is fulfilled. There is coherence in Moto immoto, but in this case it is not liberating. Rather, it is intense. In Moto immoto we also clearly hear parallels with the American minimalists and composers such as Philip Glass. It is the energy in the individual musical cells, and it is the smooth transitions between them, as well as a particularly clear-cut dynamic, that turn one’s thoughts in that direction. The work was originally composed for elec­tronics, where recordings of a symphony orchestra formed the material for the com­po­sition. In 2015 Lohse re-composed this work for ensemble, so the music has progressed from electronics and orchestra to acoustics and sinfonietta, and although this transfor­mation of course creates differences in sonority, the structure and the ‘mobile’ technique are the same.